As the 84th Legislative Session begins, our lawmakers are only constitutionally required to do one thing: pass a budget. While likely to pass over 1,000 other pieces of legislation, the Legislature is legally bound to determine the funding for state services for the next biennium. 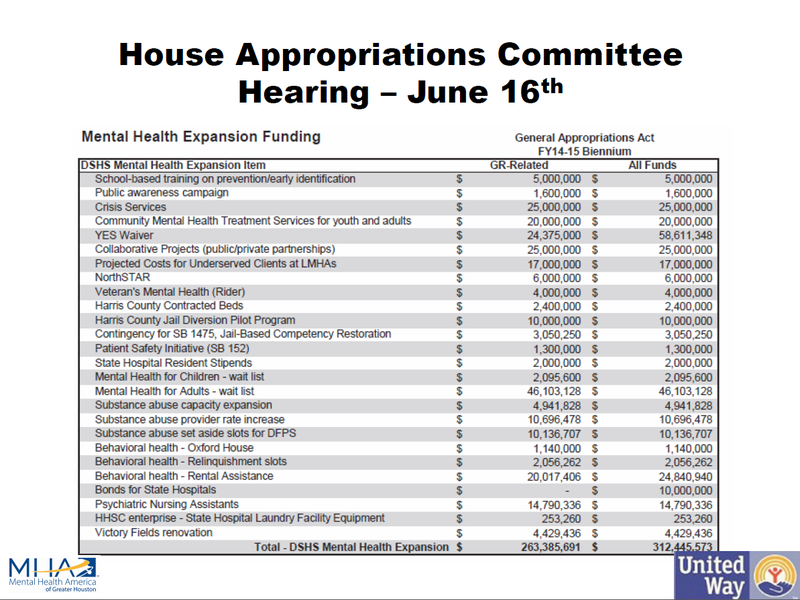 And that bill, the Appropriations Bill, is where questions about the financing for mental health services are answered. Before looking at this biennium, it is worth looking at were we started. Historically, Texas has not funded services on the level with other states. The best study of this was done by the Kaiser Family Foundation in comparing per capita spending on mental health services. 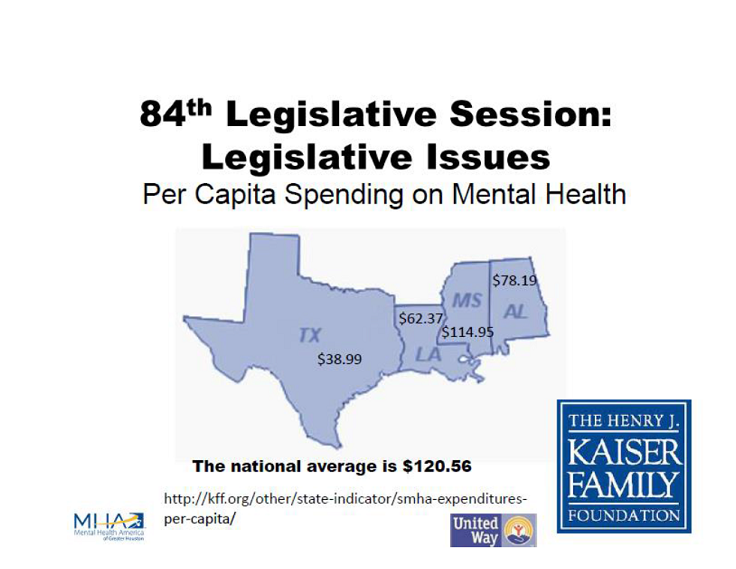 So with that historical under investment in mind, what does Texas spend on mental health now? To best show the answer, our friends at the Meadows Mental Health Policy Institute produce the following slide that breaks down the figures. 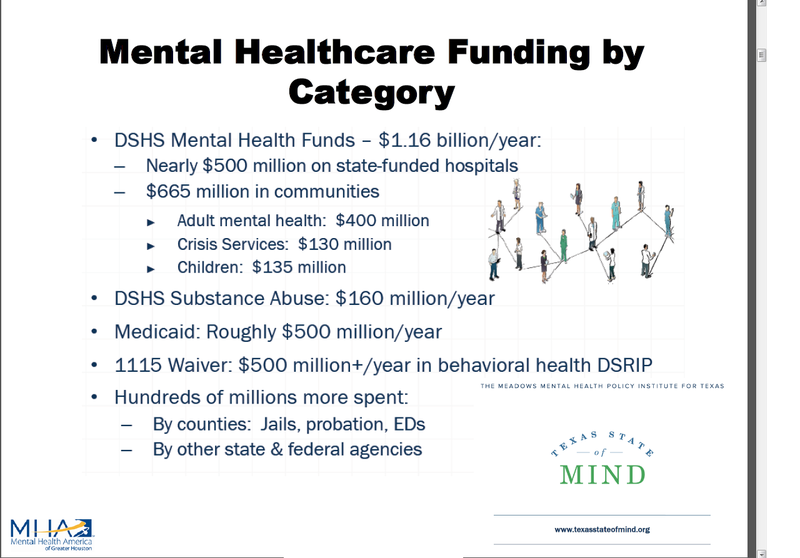 The vast majority of state spending on mental health comes from the $1.16 billion spent yearly by the Department of State Health Services. Roughly $160 million a year is spent on substance abuse. Getting your head around those big numbers helps to show just how successful the last legislative session was for funding. A chart from the House Appropriations Committee hearing this summer outlines the additional $312 million in increased spending within DSHS. A breakdown of these additional expenditures is listed on the attached chart. While badly needed, last session’s invest won’t solve the problem of serving Texans with mental health needs. Aside from continued investment from lawmakers, Texas needs to expand the footprint of services so more people can have access. Thanks to a partnership between Texas and the federal government, and yes you heard that right, we are doing just that. More on that next time. We would like to thank both Houston Matters and the Meadows Mental Health Policy Institute. To hear the rest of the interview, listen here at the Houston Matters website. This episodes music included “Never Let it Go” by Bluesraiders, “Strange Sensations” by Anitek and “Plethora” by Anitek. Welcome to the 84th Legislative Session! My name is Bill Kelly, the Director of Public Policy & Government Affairs here at Mental Health America of Greater Houston. With the start of new year comes 140 days of governing, and that means our advocacy will be kicking into high gear. We invite you to keep up with our work by following our new Legislative Blog, “Minding Houston” where we will share the latest on issues and bill movement. 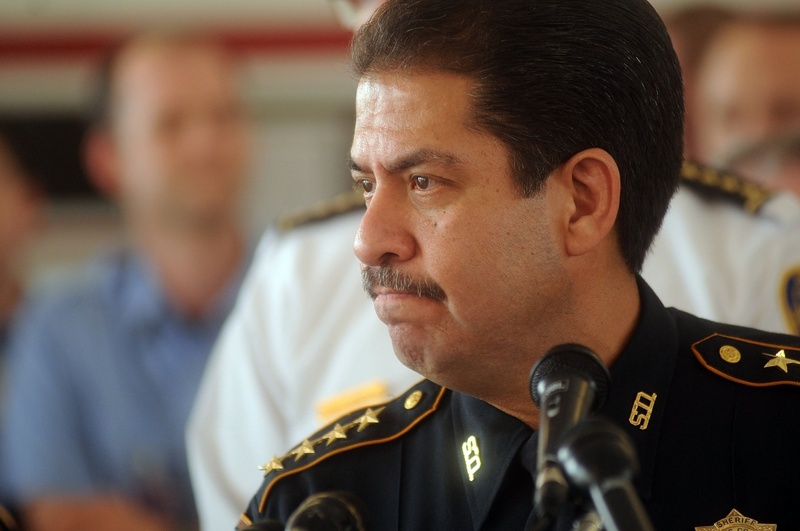 I’ve been a Chief of Staff for a State Legislator and worked for the Mayor’s Office at the City of Houston. I’m very proud to work for the issues and policies that Mental Health America of Greater Houston has endorsed and look forward to using this blog to keep you updated on legislative progress. Enter your email address (see top right of page) to subscribe to this blog and receive notifications of new posts by email. Then select, SIGN ME UP. Since the last Legislative Session ended, there have been a number of press reports about the progress made in Texas in mental health funding. The purpose of this blog is to help keep you updated with what policies Mental Health America of Greater Houston will be working on during 2015 and the stories of real people that these policies impact. 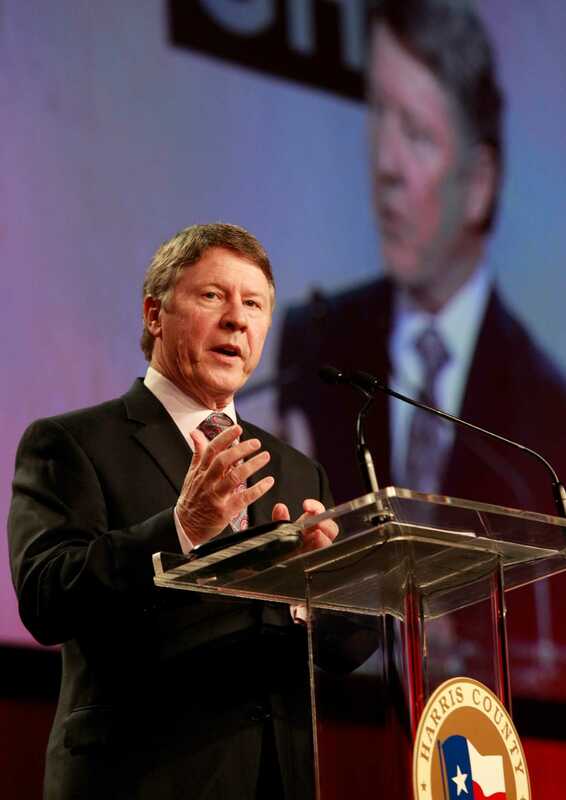 Recently, the Mental Health America of Greater Houston Board has approved series of Legislative Priorities. It is our hope to help tell the stories of how and why policy changes have dramatic impacts for the quality of life for those with loved ones suffering from a mental illness or substance abuse problems. By highlighting our priorities in press stories, we hope to raise the attention of lawmakers and hope they continue their efforts to invest in mental health. To help set the stage, check out this article from our friends at the Houston Chronicle on July 12th. Advocates are urging Texas lawmakers to remember the problems in the state’s mental health system after a couple of hearings in which progress on mental health has been cast as one of the Legislature’s greatest recent accomplishments. Last session’s roughly $350 million increase in funding for mental health and drug abuse services helped reduce the number of Texans on a waiting list for psychiatric treatment from 5,515 last February to 790 this February, including from 1,750 to zero in Harris County, and 194 to 11 among children. The reductions were hailed at a state House Appropriations Subcommittee meeting last month. 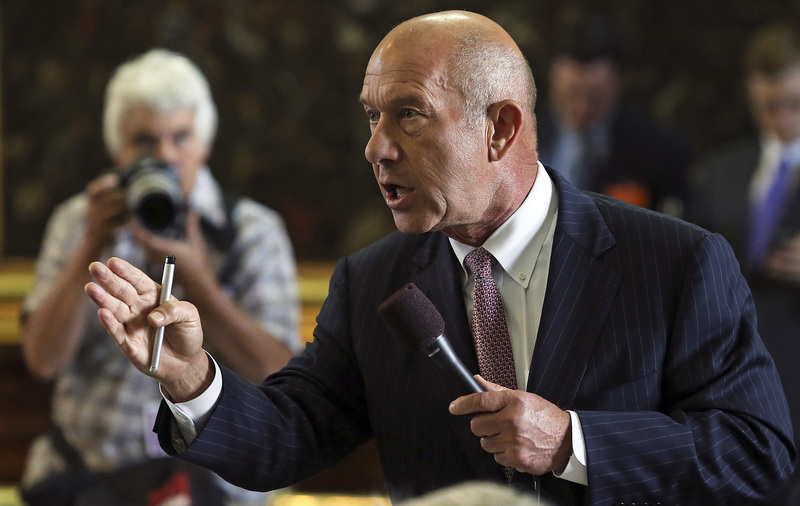 “That’s an extraordinary outcome,” said Rep. John Zerwas, R-Richmond, the panel’s chairman. This is where we hope to help Rep. Zerwas and the strong bipartisan coalition that wants to reduce the expensive consequences of failing to invest in mental health services. We need to move forward, and we know that we can by showing the solid return on investment that come with funding. Music from this episode: “The 3rd” by Anitek and “Looping Guitar Improv in Em” by Steve Combs.